Imperial Dropship: Deploy the troopers with the LEGO Star Wars Imperial Dropship! Load them onto the platform and store their stud blasters for the flight. Then sit the Shadow Trooper in the cockpit, fire up the engines, and blast off for another exciting battle against the rebels! 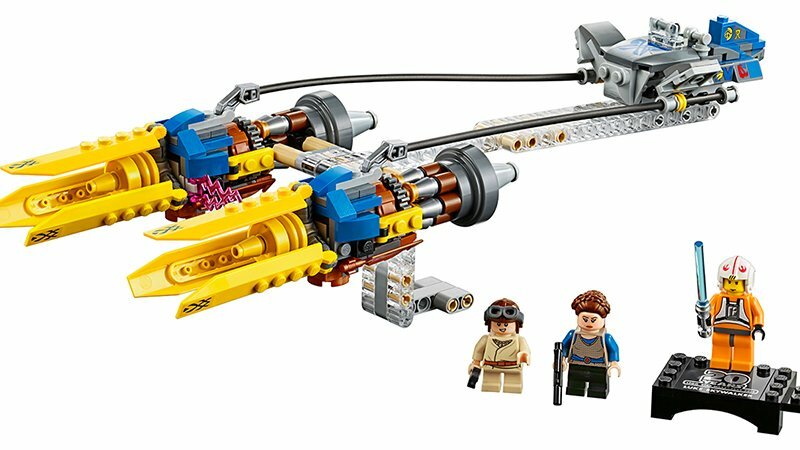 Anakin’s Podracer: Speed to victory in Anakin’s Podracer! Sit young Anakin Skywalker in the cockpit and lower his goggles ready for the race. Then fire up the huge engines, grab the play handle and zoom through the canyons of Tatooine… or your living room! With Anakin at the controls, victory is yours! Clone Scout Walker: Protect the Wookiee warrior with the armored Clone Scout Walker! Sit the Kashyyyk Trooper in the seat of the armored AT-RT Walker and stride in battle. Turn and fire the stud shooter before the Dwarf Spider Droid destroys the trench with its own stud shooter. The Clone Army must win at all costs! Snowspeeder: Sound the alarm, Echo Base is under attack! Win the Battle of Hoth with Luke and Dan Ralter in their amazing LEGO Star Wars Snowspeeder from Star Wars: The Empire Strikes Back. Speed over the ice and launch the spring-loaded shooters. Then fire the rear stud shooter and harpoon with string. On the ground, help the Rebel Trooper take aim and fire the gun tower stud shooter. Those Imperials must be defeated! Slave I: Build Boba Fett’s personal Slave I starship and travel with him through the LEGO Star Wars galaxy in search of fugitives! Grab the handle and fly him around. Pull the triggers to fire the spring-loaded shooters. Load Han Solo trapped in carbonite into the hold and deliver him to collect your payment. It’s another exciting day in the life of a bounty hunter! RELATED: 14 High-Res Star Wars: The Rise of Skywalker Photos Revealed! LEGO Star Wars was first introduced at the International Toy Fair in New York in February 1999 and has been captivating fans ever since. An impressive 13 sets were launched that year, as well as a LEGO MINDSTORMS Droid developer kit. Over the years, many crowd pleasers have been released, including the first version of the Chewbacca mini-figure. This was a triumph in itself because of its challenging design. The design team came up with the idea of creating a head with fur covering the back and front of the torso, which has been used in many mini-figure designs since. “LEGO play and Star Wars is a dream collaboration for us, and we feel privileged to have one of the strongest fan communities out there who continue to inspire and challenge us to push the boundaries. This 20-year milestone is really a dedication and testimony to our loyal fans who have built, reimagined, battled and shared their LEGO Star Wars adventures with us for two decades. Twenty years on, the Force is still with us and there’s still so much more to come,” said Jens Kronvold Frederiksen, Creative Director of LEGO Star Wars. LEGO Star Wars was the LEGO Group’s first IP franchise and has since remained one of the most popular, allowing fans across generations and geographies to come together in fun and challenging building exercises. Around 700 different sets (including 1,000 LEGO Star Wars mini-figures), five video games, several television and web series, and an abundance of other fun merchandise have been released since the initial launch. The post LEGO Star Wars Special Edition 20th Anniversary Sets Revealed appeared first on ComingSoon.net.